Yonked :: Diary of a New Home: My wish comes true: Bee Line to take Metrocard! One of my most sincere wishes has been that the Westchester Bee Line would take the Metrocard. Well, starting April 1, 2007, that wish will come true. Here's the announcement of the meeting. 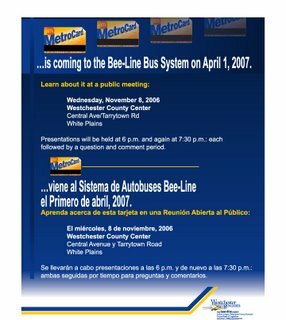 Comments on "My wish comes true: Bee Line to take Metrocard!"